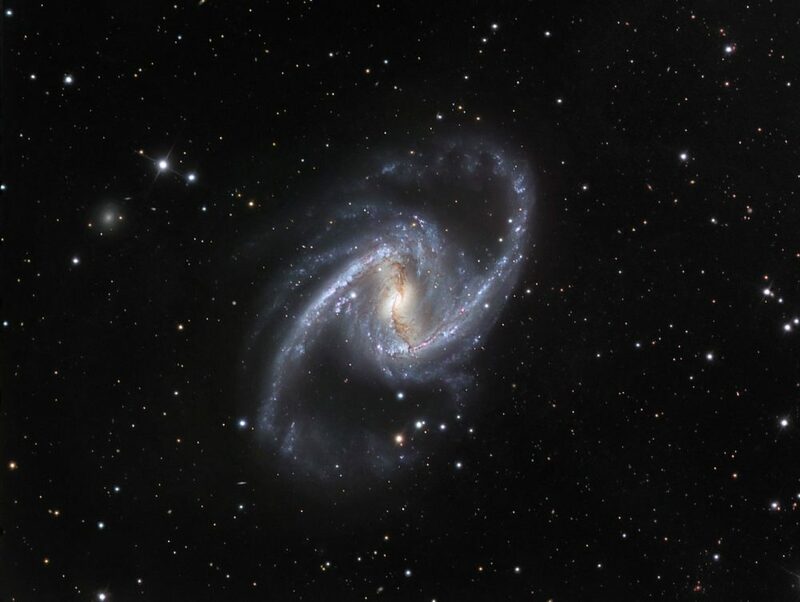 NGC 1365 is a barred spiral galaxy located in Fornax constellation. It has an apparent visual magnitude of 10.3 and is approximately 56.2 million light years distant from the Sun. The giant Seyfert-type galaxy is also known as PGC 13179, or the Great Barred Spiral Galaxy. It is the largest spiral galaxy in Fornax and may be the most prominent barred spiral galaxy in the night sky. NGC 1365 is the dominant member of the Fornax Cluster, a cluster of galaxies located in the direction of Fornax constellation. The galaxy is approximately 200,000 light years in diameter, which is twice the length of the Milky Way, and has roughly the same mass as our galaxy. The galaxy has a bright, oval-shaped core about 50” x 40” in apparent size, and two large, prominent spiral arms that form the shape of the letter Z. The spiral arms are home to numerous star forming regions. Spiralling around, 61 million light-years away in the constellation Fornax (the Furnace), NGC 1365 is enormous. At 200 000 light-years across, it is one of the largest galaxies known to astronomers. This, plus the sharply defined bar of old stars across its structure is why it is also known as the Great Barred Spiral Galaxy. Astronomers think that the Milky Way may look very similar to this galaxy, but at half the size. The bright centre of the galaxy is thought to be due to huge amounts of superhot gas ejected from the ring of material circling a central black hole. Young luminous hot stars, born out of the interstellar clouds, give the arms a prominent appearance and a blue colour. The bar and spiral pattern rotates, with one full turn taking about 350 million years. This image combines observations performed through three different filters (B, V, R) with the 1.5-metre Danish telescope at the ESO La Silla Observatory in Chile. Image: ESO, IDA, Danish 1.5 m, R. Gendler, J-E. Ovaldsen, C. Thöne, and C. Feron. NGC 1365 has an active galactic nucleus (AGN).The galaxy’s core is obscured by dust lanes and contains a supermassive black hole. The prominent bar is believed to draw the dust and gas that trigger the star formation in the galaxy and fuel the central black hole. The bar rotates clockwise and completes a rotation every 350 million years. The rotation velocity in the galaxy’s nucleus is believed to be about 2,000 km/s. In 2013, scientists were able to measure the rotation speed of the galaxy’s central black hole, discovering that the supermassive black hole, which is about 2 million miles wide, rotates at nearly 84 percent of the speed of light, which means that the surface is spinning at nearly light speed. This was the first time anyone was able to accurately measure the spin of a supermassive black hole. Four supernovae were observed in the galaxy: SN 1957C in 1957, SN 1983V in 1983, SN 2001du in 2001, and SN 2012fr in 2012. The last one, SN 2012fr, was discovered on October 27, 2012. It was a Type Ia supernova, a violent explosion of a white dwarf star.